This post considers 4 pieces of music that fall within a broad conception of “classical music”. All of these works include “condor” in their title. But which condor is referred to by this music? None of the pieces clearly refer to the California condor; it’s either the Andean condor or it’s unclear. I’ll start with the latter. 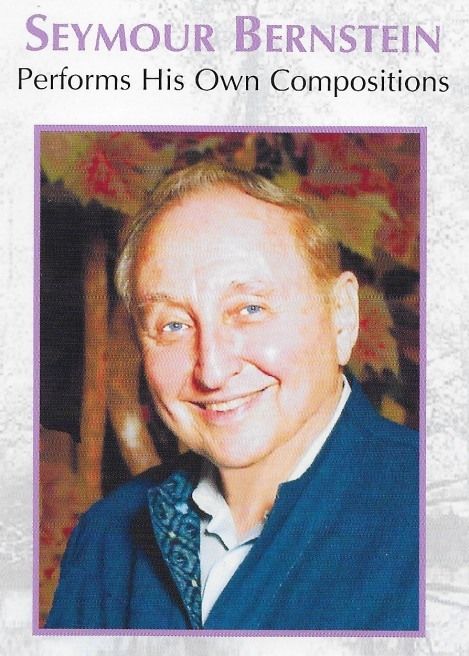 The 2-CD set Seymour Bernstein Performs His Own Compositions includes “Birds, Book Two”. This composition is undated but the CD is dated 2005. Written for and performed on the piano, “Birds, Book Two” includes 9 movements, each named after a different bird. The movement titled “Condor”, just a minute in length, juxtaposes ponderous minor chords and high-pitched, dissonant trills. This music conveys an impression of a great and mysterious bird. Among the other works on the CD set are “Birds, Book One”, and suites titled “Insects” and “Trees”. The latter includes “The Sequoias”, suggesting that Bernstein may have a connection to California – and, perhaps, the California condor. Christian Lindberg’s “Condor Canyon” is on the CD titled A Composer’s Portrait (BIS Records). Lindberg is a Swedish composer and trombonist. “Condor Canyon”, a piece for trombone and brass quintet, is dated 2000. This music imparts a feeling of continuous movement, with occasional upward, soaring lines. There is a dignified character to the melodic lines. The trombone does seem an appropriate instrument to “represent” the condor. As I started on the piece a couple of motifs came into my head, sounding like huge, wonderful birds soaring high up in the clouds. I decided to name each motif after its different character: ‘Atlantis the albatross’, ‘Ocea the ocean queen’ and ‘Motes the manic’ were some of the names, and they finally led to the title Condor Canyon. I never had the intention of writing programme music, however – this is a pure concert piece and nothing else. The names of the themes only helped me to get inspiration …. I have not found any evidence as to whether Lindberg was inspired specifically by the Andean or California condor. John Scott composed music for Hugh Hudson’s documentary film Birds and Planes. This film score is on the CD titled The Shooting Party (JOS Records). The recording was made in 1964. One movement of the score is “Condor and Glider”, which brought to mind Erik Satie’s spare and beautiful compositions. I can remember reasoning with myself that the string quartet would represent the feeling of nature while the piano and basses would be more heavy, brooding, powerful and at times more mechanical. It didn’t quite work out that way because I found myself using the piano for the grace of the condor in flight …. I look forward to seeing the film Birds and Planes. That may answer the question of which condor is referred to in this music. Heinrich was born in what is now the Czech Republic. It was only after arriving in the USA in the early 1800s that he began composing and performing music. 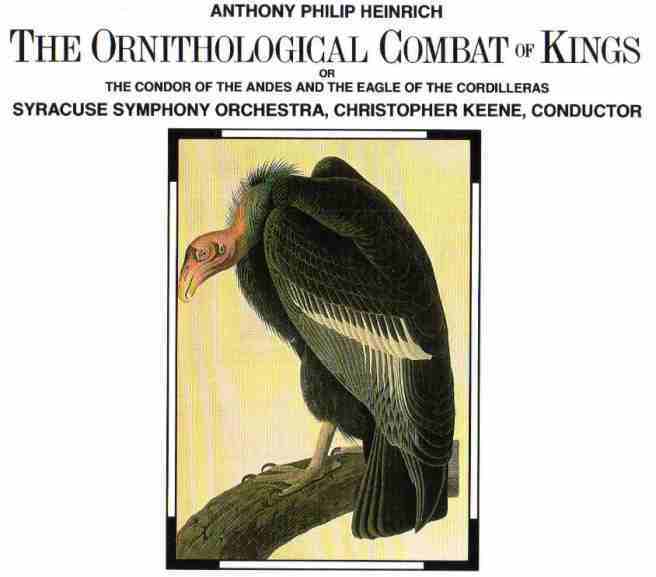 The original version of Ornithological Combat dates from the 1830s but the piece was subsequently revised. The style of Heinrich’s Ornithological Combat is of its time: early in the Romantic period. The symphony does not evoke combat of any sort (at least to my modern ear). The music seems perfectly suited for traditional ballet. Writing in the liner notes that accompany the CD, David Barron reports that the CD presents the 1st recording of the complete Ornithological Combat. Barron also notes that Heinrich knew John James Audubon and that this friendship inspired Ornithological Combat and another bird-themed work, The Columbiad or Migration of American Wild Passenger Pigeons. These symphonies reveal surprising connections in the U.S. consciousness between birds and national identity in the nineteenth-century United States. 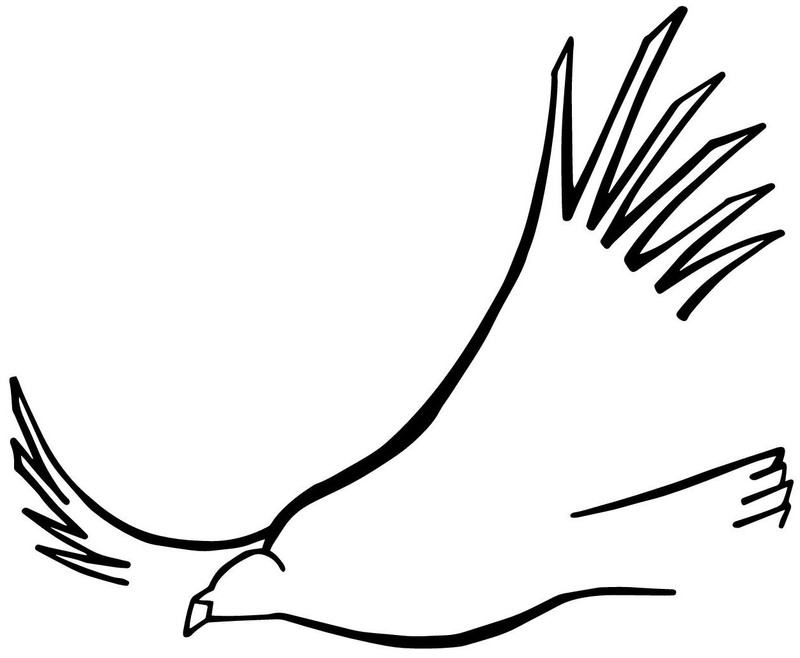 I have recently identified a number of scores for classical music that reference the “condor”. I will write about these in a future post. I just encountered “California Condor Chaconne” by John Laurence. This 2018 work for piano and string quartet is available in digital form (and is associated with a fine illustration of the condor).